Keep squirrels from enlarging the entry on your bird house with the Coveside Slate Hole Protector. 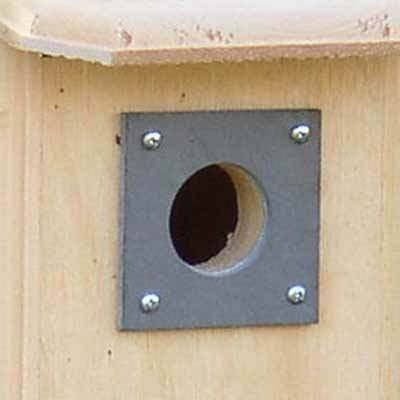 Placing this plate around the 1.5" diameter entrance hole on your existing bird house creates a strong, lasting barrier. The natural slate construction is difficult to break, and will easily deter squirrels and woodpeckers from altering your bird house. A predrilled hole in each corner allows you to attach the item to your wooden house in moments with the included screws. Its gray color will match virtually any home, and the slate construction adds lasting protection. Offer your backyard birds a safe roost with help from this Slate Hole Protector. Made in the USA. Note: As slate is a natural material, some variations in thickness and color throughout the item may occur. This description refers only to the Slate Home Protector. The house shown is not included.